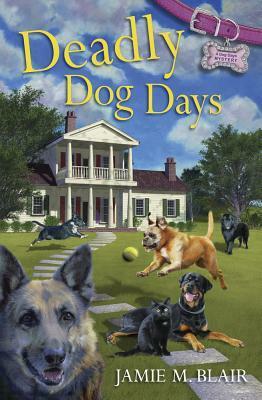 Deadly Dog Days is the first book in the Dog Days Mystery series. While trying to enjoy her lunch break, Cameron is unfortunate enough to discover a dead body in the canal. She then finds herself, and her soon to be ex-husband, being suspected of murder. Cameron decides to use her team of community service-hour seeking volunteers to help her investigate. Add in one step-daughter who has come to stay, and the victim’s 5 unruly dogs, and Cameron really has her hands full. NOTE: I voluntarily reviewed an advanced copy – all opinions expressed are my own. < Previous The Case of the Missing Morris Dancer – Guest Post and Giveaway! I love the cover! It really makes me want to read the book. Book sounds amazing, definitely adding to my TBR list. I agree – I do like that cover! Will have to read. Thanks for the review. Sounds like fun to read.